In 2004, at an appointment to scan his kidney stone, doctors found a large tumor in Terry Rudnick’s pancreas. After surgery to remove two-thirds of his pancreas and a pathology report, a cancer specialist wasn’t optimistic. Terry and his wife Roberta asked for a referral to Virginia Mason and saw Vincent Picozzi Jr, MD. To give back and help doctors and researchers move closer toward a cure, the Rudnicks created the Fisherman’s Breakfast Fundraiser. 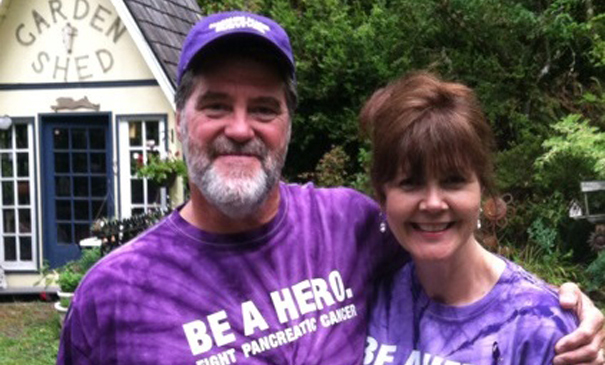 “We want to give pancreatic cancer patients hope for longer, healthier lives,” they emphasize. In 2012, they hosted a fisherman’s breakfast during a salmon derby on the beach in front of their house on Dana Passage in South Sound. All proceeds were donated to the Virginia Mason Pancreatic Cancer Research Foundation.